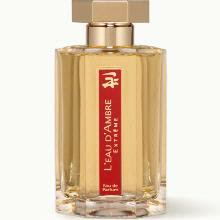 News reached me yesterday of the passing of Jean Laporte, the man who founded one of my favourite fragrance houses L’Artisan Parfumeur in 1976. L’Artisan was truly one of the first niche houses and his work was exemplary. I had been planning a L’Artisan post for a while so thought it would be appropriate to mention two of my L’Artisan favourites here. Unlike some tuberose fragrances, Nuit de Tubereuse is built around an absolute of tuberose and is at turns, woody, spicy, citrus and light. A confusing but intoxicating scent and utterly divine. Also possibly my favourite perfume bottle – ever. I can’t think of L’Artisan without thinking of amber, and my preference is for the Extreme version. It’s a soft mix of vanilla, geranium and amber and is for me, a must for the colder months. I’ll be wearing it today.